Genetic analysis has been used to determine how often Hawaiian Coot and Hawaiian Gallinule move between islands, with the latter potentially threatened by its reluctance to wander. The results, published in The Condor: Ornithological Applications, showed that Hawaiian Coots disperse frequently between islands but Hawaiian Gallinules – a subspecies of Common Gallinule – don't, putting them at greater risk from severe one-off events such as hurricanes. The US Fish and Wildlife's Jared Underwood and his colleagues trapped birds on Oahu and Kauai, taking blood, tissue and feather samples from both species. Genetic analysis conducted at the US Geological Survey by Sarah Sonsthagen and her colleagues showed the difference in movements between islands the two species have. It's believed that Hawaiian Coot populations at some wetlands are beginning to reach the maximum numbers they can support, hence the dispersal of birds in search of new territories. 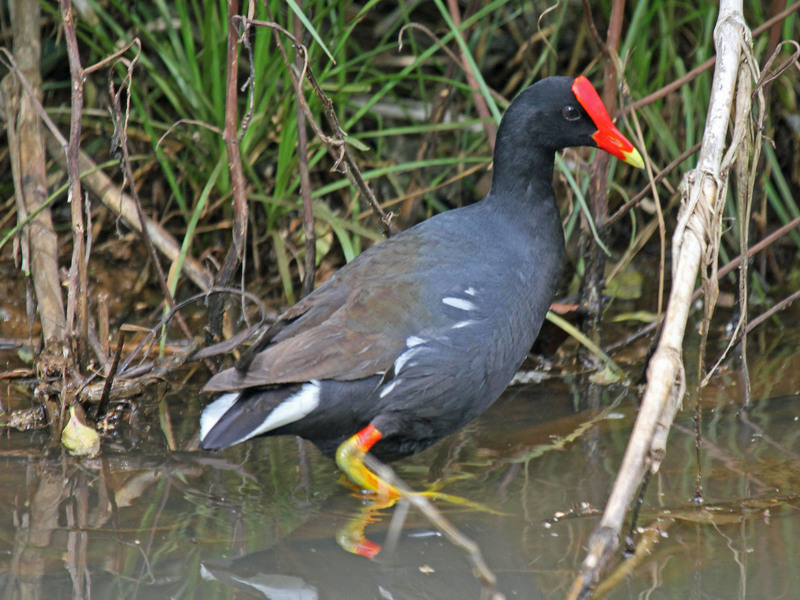 The same behaviour is also thought of in Hawaiian Gallinules, though, so either their behaviour has changed or – unlike the coots – they've yet to reach population capacity at current sites. With their reluctance to move, Hawaiian Gallinules are more at risk from one-off events such as hurricanes (commons.wikimedia.org). Hawaiian Gallinules' reluctance to move means their population would be far more exposed to one-off events such as hurricanes, which could wipe out an entire island's worth of birds. Their lack of gene flow also means that populations on individual islands need to be larger in order to be viable in the long term. The Hawaiian islands are home to a range of unique, endangered bird species. Both the coot and gallinule have been recovering in recent decades thanks to intensive wetland management, but past declines have left them with reduced genetic diversity. Co-author Jared Underwood said: "The Common Gallinule as a species is considered quite vagile, so it was surprising to find a high level of genetic structure between two islands separated by only 175 km. Other Common Gallinule subspecies found in the Pacific frequently move between islands that are separated by greater distances." Despite the recent population gains, the researchers warn that rising seas, diseases and introduced predators continue to threaten both species. Underwood added: "A key component of the resilience and persistence of species and populations is the retention of genetic diversity. Information regarding the genetic structure for each species will allow managers to design different strategies and criteria for the species’ recovery." Sonsthagen, S A, Wilson, R E, & Underwood, J G. 2018. Interisland genetic structure of two endangered Hawaiian waterbirds: The Hawaiian Coot and Hawaiian Gallinule. The Condor: November 2018, vol 120, no 4, pp 842-851.